A last, a safe bell for parrots to enjoy in or out of the cage. Although we are not the makers of this bell we have re named it the "Bertha-Hope Bell" in honour of a beautiful African Grey at the Island Parrot Sanctuary, Kerrera. Through her traumatic little life the one thing that has kept her going is her love of bells and now thanks to this great design she can enjoy it safely to her hearts content. 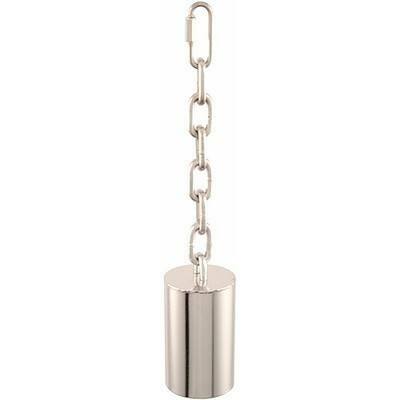 Paradise Toys , the creator of this Stainless Steel bell have designed it in a way that the clapper can not be removed. It also comes with a Stainless Steel quick link. Suitable for: Large to Extra Large Parrots. And here is "Bertha-Hope". She may be a wee blind girl but within 2 seconds of her new bell being introduced into her cage, her utter joy was so evident and she wasted no time in getting straight into creating the sweetest music. Ding-a-Ling-a-Ling. Please check out these links for our info pages on, Safety First. Please note: We have found no definitive list for size guidance and some parrot types will fall into other categories, please know your bird or seek assistance from your avian vet. If in any doubt contact us, as we are always happy to help. 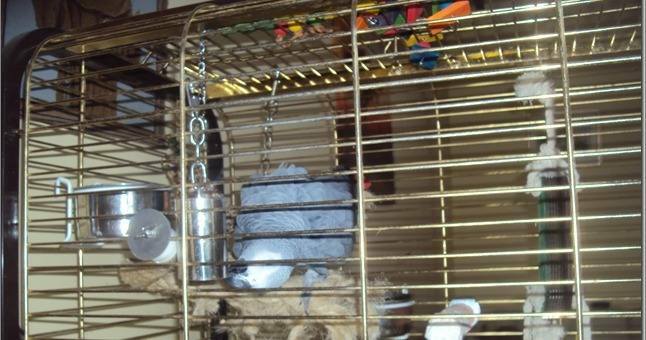 Mini Birds - Budgies, Lovebirds, Parrotlets and similar sized birds. Small Birds - Cockatiels, Grey Cheeks, Small Lories, Green Cheek Conure, Black Cap Conure, Maroon Bellied Conure, Caique, Quaker Parrot and similar sized birds. Medium Birds - Ringneck, Senegal, Large Lories, Yellow Collar Macaw, Hahn's Macaw, Severe Macaw, Sun Conure, Blue Crown Conure, Pionus, Rose Breasted Cockatoo and similar sized birds. Large Birds - Congo Greys, Blue Front Amazon, Timneh Grey, Yellow Crown Amazon, Yellow Nape Amazon, Eclectus, Red Front Macaw, Bare-eyed Cockatoo, Ducorps Cockatoo and similar sized birds. Extra Large Birds - Umbrella Cockatoo, Moluccan Cockatoo, Triton Cockatoo, Blue & Gold Macaw, Green Wing Macaw, Scarlet Macaw and similar sized birds. The above classifications are for guidance only. Please know your Parrot and their individual habits.